One rarely hears much about Burmese food. It’s usually overshadowed by the glories of its Chinese, Thai, and Indian neighbors, and generations of war and poverty have done a great deal to dampen the spirits and capacities of its cooks. Sure, a few Burmese restaurants straggle along in American cities here and there, but you’ll be hard-pressed to find something on their menu you couldn’t eat in one of Burma’s neighboring countries. Except, that is, for Burma’s salads, which I have never, ever seen on a Thai menu. Here are three salads served at one of the dingiest and most depressing restaurants I’ve patronized in Chiang Mai. Its walls are covered with outdated posters from NGOs that work on the Thai-Burmese border and a huge image of Daw Aung Sang Suu Kyi. A fine layer of grime covers everything that’s not on the table. But I return as often as possible and avert my eyes so that I may eat these salads. 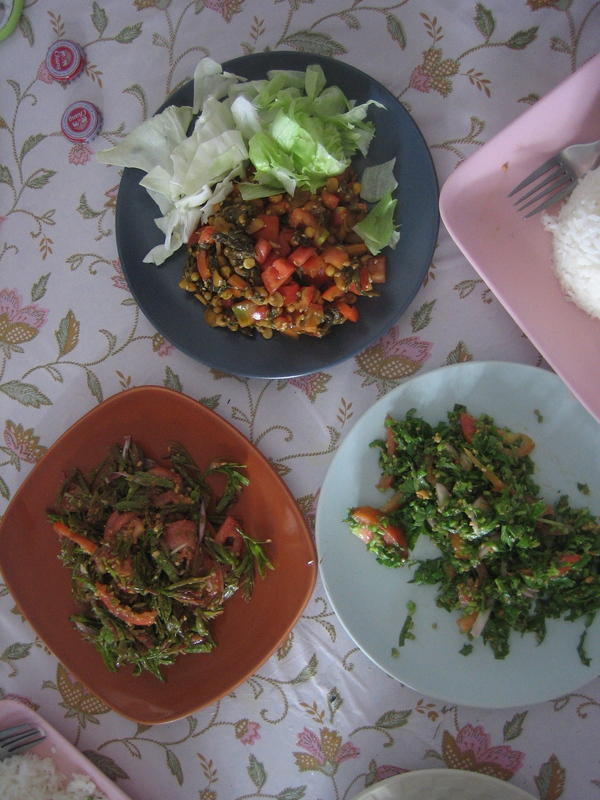 Clockwise, we have the classic fermented tea-leaf salad (laphet thoke), a pennywort salad (min kwa yuet thoke), and a tamarind-leaf salad (migyia thoke). They all look similar, what with the heavy presence of tomatoes, but they taste radically different from one another. The tea-leaf salad is tart and crunches with deep-fried mung beans. The pennywort salad tastes like the color green, for lack of a more imaginative simile: clear, tender, pure, and mild, and was enriched by ground peanuts. It is the last, however, the tamarind-leaf salad, of which I will dream after our return to Massachusetts. The tamarind leaves have a texture I want to describe as al dente ferns. Generously salted and dressed with fried broad beans and crispy onions, they bear none of the sourness of the tamarind fruit, and instead have the richest flavor of any green I’ve encountered. 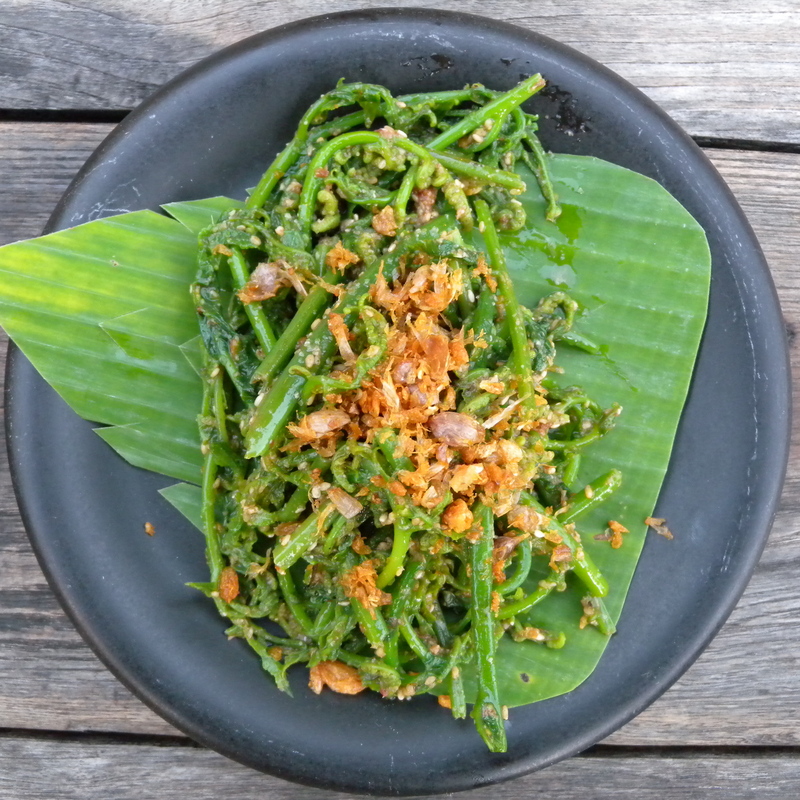 Lest one think these delicacies are only found in big-city restaurants, this fern salad was served in an open-air Shan restaurant in Mae Hong Son, a small mountain town close to the Burmese border, where ethnic Thais are a distinct minority (here, Thailand borders Shan State in Burma.) The ferns were parboiled and dressed with sesame oil and sesame seeds, staple seasonings in the region. None of these salads have any vinegar or added tartness (outside of tea-leaves’ natural astringency and the acid in the tomatoes), and they are delicious enough to make me wonder whether I should bother with vinegar at all once we return home. As I described earlier, khao soi is a well-traveled dish, and Chiang Mai’s version is merely the end of the line that begins with Muslim traders coming down through Shan State. Little did I know, but all this time, the original—or at least something close to it—has been available at a stall in the Chiang Mai Night Market, served up by teenagers wearing beautiful headscarves and pink lipstick on their scowling mouths. Once you get past their surliness and manage to get them to hear your order, they will serve you plates of khao soi Yunnan. No soupy broth or crispy deep-fried noodle topping enhance this version. This is a much simpler dish. 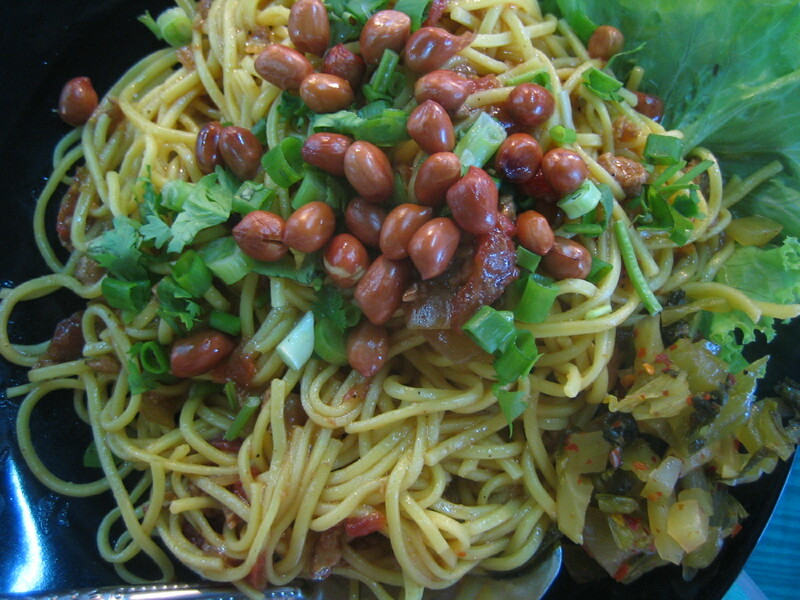 These hand-made wheat noodles are what the Thais would call haeng, or dry. They are cooked, chilled, and topped with a sauce of ground chicken (pork being forbidden), roasted peanuts, cilantro, scallions, and the same tart pickled cabbage and shallots that is served with khao soi Chiang Mai. It’s not my favorite, managing to be both bland and tart at the same time. Perhaps I might like it better if it were served with a smile. In Mae Hong Son, we spent several mornings huddled inside the market, eating bowl after bowl of khao soi from a Shan vendor and drinking instant coffee while waiting for the sun to burn off the chilly mist. 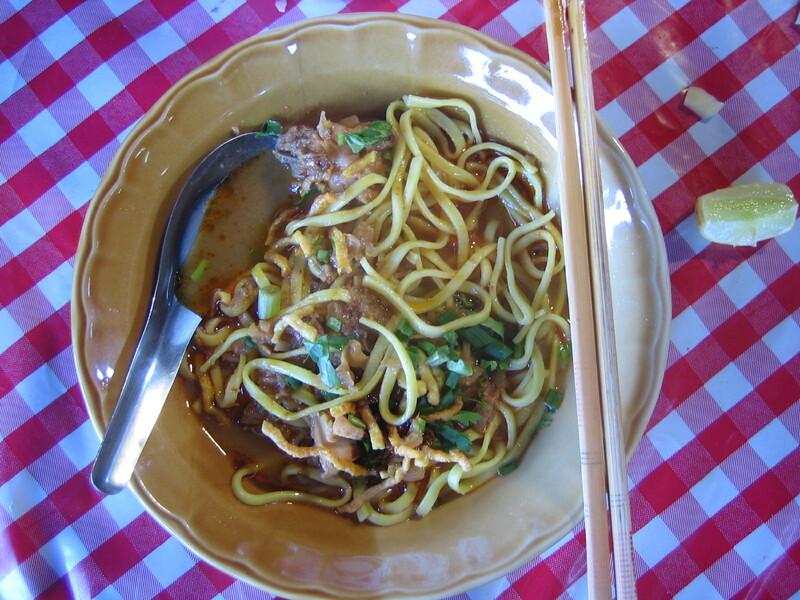 Shan khao soi is something of a transition point between khao soi Yunnan and khao soi Chiang Mai. Shan khao soi is soupy, but the richness comes from oil and not from coconut milk. Like its Muslim relations, it offers chicken instead of pork. At the end of the day, I remain devoted to the Chiang Mai khao soi muu at Samoe Jai, in which coconut oil milk balances out the oil, the broth is an art form in its own right, and the curry sings equally of tang and heat. Or maybe it’s my preference for tender slices of pork over chunks of bone-in chicken. But I woud happily eat my way down the khao soi pilgrimage trail again. I hear the khao soi in northern Laos is completely different. One of the great delights of Thailand is its generous and affordable cashew crop. They are commonly sold with little packets of moist salt enclosed, so that you may salt them to your liking. Because they are roasted immediately after harvest and sold soon after that, they have a sweetness to them that’s hard to find in the States. The Thais love to salt sweet things, and to sweeten salty things, which I sometimes find disconcerting. With these candied cashews, however, they have reached perfection. 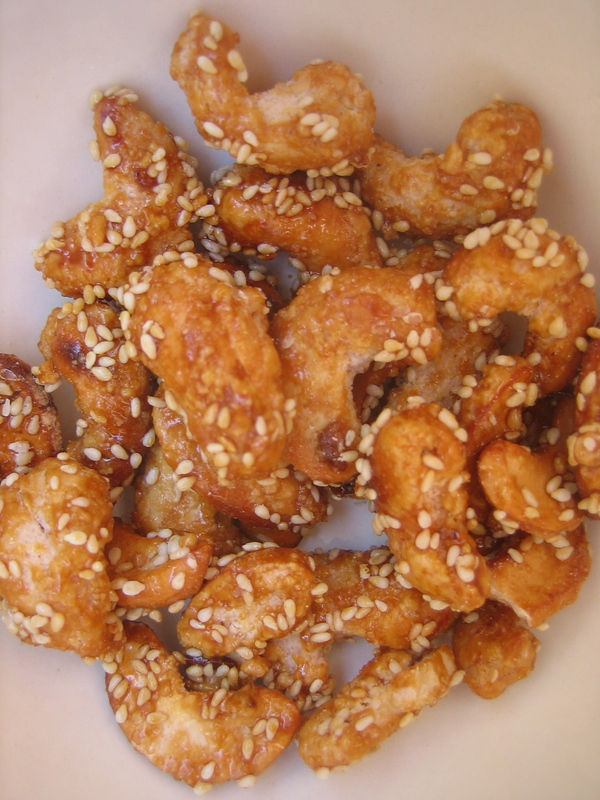 The cashews are roasted and then glazed lightly with a sesame brittle. The brittle preserves the flavor of the cashews and heightens their sweetness, while providing enough saltiness to keep the nuts from cloying. Unlike peanut brittle and the like, the cashews remain crisp and tender enough so that they don’t overwork the jaw (or endanger dental work). They are like the very best part of Cracker Jack, the candied peanuts, but one million times better. If you are reading this and are considering a trip to Thailand, here are my last words of wisdom on eating in this country. 1) Eating only little snacks, street-stall plates, and fruit is an excellent strategy, at all hours of the day, and in all locations. 2) The more you pay for a meal, and the fancier the surroundings, the more likely it is to be lousy, and to give you stomach trouble. The converse is even more true, assuming that the restaurant or stall is busy: the less you pay, and the grubbier the surroundings, the more likely the food is to be delicious and clean. When a cheap and dingy restaurant is crowded, you can be sure that the staff is too busy serving fantastic food to be bothered with the decor or unnecessary cleanliness. That’s where you want to eat. 3) If you don’t know what something is, and you see other people eating it, eat it. Just shut up and eat it. Chances are you’ll be very, very glad you did. I love your post! I just got back from Chiang Mai and have been searching frantically for a recipes for tea leaf and tamarind leaf salads! If you come across any, please let me know! I wish you would start a business giving eating tours through Thailand. I would sign up for THAT vacation!